It is a job, with all the bells and whistles and hoopla, at the end of the day, it is still a business. What was I thinking getting into this at my age, with no training? Well, let me see if I can get to the bottom of it. Writing. I decided to write as therapy. Creating a journal to cope with all the different trials and tribulations life was throwing at me. Since my imagination is still just as vivid as it was when I was a child, I decided to try something different. I decided to take a six inch character and bring them to the front of the scenes, outside of the children's world. I created a Pixie world and brought a little fantasy and romance into it. Since there is some form of Pixie or Fairy in a lot of fantasy stories, I decided to make these a bit different. Sure, they can fly, but they have no Pixie dust. They are muscled and built, but do not dress in Peter Pan style clothing. They are romantic and strong, knowing just how to protect what is theirs. Inside their world I decided to bring their villages to scale with them through witchcraft, leaving you to follow along and forget they are just Pixies, until danger arrives. Their day to day life is not much different from ours. Of course, minus the modern conveniences we love in our life. Self publishing has been a really nice challenge. But, all the research in the world could not prepare me for the mountain I had to climb on this one. Choosing the right site, formatting to fit their requirements, and finding art for a cover are but just a few of the challenges awaiting you. Finding my way onto twitter was one of the saving graces of the whole process. Finding some if my favorites along with meeting new writers was great, but finding them to be helpful and encouraging was spectacular. Knowing they were there for advice, freely given advice, made the story in my head become a reality on paper. The dreams of a huge publishing house wanting to take the story to the ends of the earth are still there. Another hurtle to conquer as I learn the ends and outs of a new business. Fishing for just the right fit at just the right time with just the right pitch. But that my friends is another story. How would we feel if we suddenly woke up in a world thought to be make-believe? 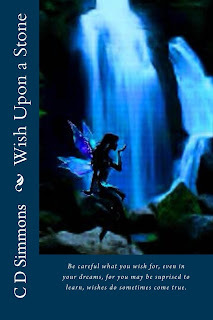 Take a stroll through the pages of WISH UPON A STONE and find out. Follow along as we find that, a sleeping wish, mixed with a beautiful stone, can turn two lives, separated by legend and law, upside down. But be warned, once you pick up this world, you may never want to leave it.